Many homes have one or more television sets in them, and some people spend a great deal of time watching them. However, what are the benefits (advantages) and disadvantages of watching TV? Is it all bad? How can parents and individuals monitor what they watch? Has the content of TV changed over the last 30 years or so? Share your ideas on this topic. The new year is just around the corner, and people around the world celebrate this day in different ways. Share your thoughts and ideas on how people in your country or area celebrate this holiday, including ideas on foods, activities, and vacation plans. Now, feel free to share any of your favorite memories of how you celebrate this holiday. If you don't celebrate this day, then tell us about other end-of-year celebrations in your country. This is followed by a discussion topic and an online activity where students can use their English to do basic information gathering on the topic. Take a look at this site. At the beginning of each new year, people often make resolutions---plans to change or improve something in their lives during the coming year. Personally, I want to improve my conditioning so I can run in a marathon this year. I ran a half marathon this past year, but I want to complete a full marathon. It's not that I really enjoy running, but the mental conditioning is something that helps my mind and body at the same time. So, how about you? What plans for change do you have for the new year? 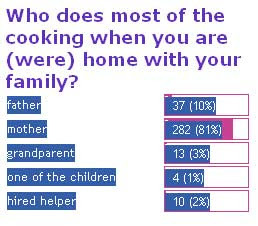 Does your mother work outside of the home, and does she still do the cooking? Does your father or other family member help clean up the dishes and table after the meal? Are more and more younger men being expected to help their wives with cooking? Holidays and festivities are an important part of our cultures, and understanding the holidays of others (especially when traveling overseas) can help us appreciate other people more. So, please share with us your favorite holiday from your country: what day is it, how is it celebrated, and what special foods and drink are associated with it? For many people around the world, religion is an important part of the lives; for others, it plays a lesser or no role. However, does a person's personal beliefs matter to you if they are running for political office in your country. In other words, would you vote for someone whose religious views differ from your own, or if the person didn't believe in God? Share your ideas on this topic and explain why. 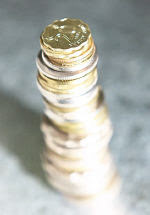 Tipping: How common is it in your country? According to this survey, a majority of people say that tipping at a restaurant is a common practice, but there are many places where tipping is not required. So, do people tip in your country? If so, where do people tip (e.g., at a hotel, hair salon, taxi, etc.) What country are you from? What percent of tip are you expected to give? Share your ideas. Superstitions: Anything Unique to Your Culture? A superstition is a belief that isn't based on fact but on old ideas, and each culture has their own. Learning about these can help us understand different cultural values. For example, in the US, it is believed that if you carry a rabbit's foot, you will have good luck. Another one is that if you go to the end of a rainbow, you will find a pot of gold. 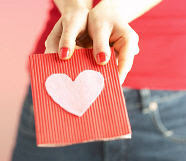 Friendship is important to most people, but ideas on what makes a good friend might be different from person to person. From the list of qualities below, which one is most important to you and why? Share your ideas and experiences on this topic. Average English Class Size: Does it matter? English is taught around the world, but the conditions are often very different. In fact, class size might be different from school to school and from country to country. But tell us about your experience. On average, how many students are there in a typical high school English class? How does this affect learning? Please share your ideas. 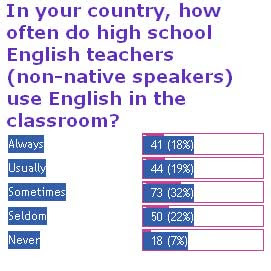 So, how much does a teacher's use of English affect students' learning of the language in the classroom?As you can see from this poll, only 37% of students responded that their teachers use/used English usually or always in the classroom, where as 29% said that their teachers seldom or never use/used English. What do you think the reasons are for these results, and in what ways does this affect students? Share your experiences and opinions on this topic. Although ESL/EFL students most of their time learning English, little time is often spent on learning about cultures and how to adjust to new environments. One of the greatest concerns is that people develop stereotypes (or negative images) about another cultures, and these perceptions can lead to making false judgements about other people. For example, many international students coming to Utah and the United States think that all North Americans eat is fast food (hot dogs, hamburgers, and pizza), but they are surprised to see that the university cafeteria serves food from all over the world, and salads are a very popular choice. So, is there a stereotype that people often have about your culture? If so, share what it is, and help us understand your culture better. School Grades: How are they determined? One question that often comes up is whether ESL/EFL teachers should grade students based on their attitude and participation in classes, and if so, how much should this be part of the grade. In other words, what is the relationship between actual English ability and attitude. In the program where I work, students can move up to the next level in the program if the pass the class with a good grade, and 15% of the grade is based on participation. However, if too much of the grade is based on just whether they participate or not, and not how they perform on language tests, students might move up but not be ready in terms of their true ability. What do you think on this topic? How should students be scored and graded? Learning English: Is exposure enough? Having taught ESL/EFL for the past 20 years, I have come to realize that mere exposure to the target language isn't enough to learn English. In other words, thousands and thousands of students come to the United States with the hope of learning the language, and their parents often think that by just being in the country, their children will pick up the language. Unfortunately, the reality is that many students come to the US, attend ESL classes, and then tend to speak their native language with their friends the rest of the day, only to return to the class the next day for a sprinkling of English. In fact, some ESL students complain that there are too many other students from their country in their class, and therefore, they can't learn English. However, these same students just speak their native language once they walk out the classroom door. For many of these students, they end up being able to carry on basic day-to-day conversations and order a hamburger at a restaurant, but they never reach a higher level of communication skills that leads to interesting conversation. What do you think about this? Famous Tourist Spots: Where do you suggest? If an international visitor were to visit your city, what places of interest would you recommend he/she to visit? It doesn't have to be an internationally-famous place, but a place where people can find out about the local culture, history, or geology. In my city, there is a famous cave called Timpanogos Cave, and it is a favorite site for locals and international visitors. You can see more about this site at http://www2.nature.nps.gov/geology/parks/tica/tica_virtual_fieldtrip/Index.htm. You can earn about the geology of Utah and the history of the people who first lived in this area. 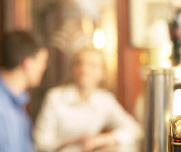 Now, please tell us about a tourist spot in your area and why we should go there. Getting ESL/EFL students to read sometimes can be a challenge, particularly if their only experience has been years of intensive reading that has been way over their head. In other words, students are sometimes asked to read articles or books that are way too difficult for them, and students then have to use their dictionaries to figure out the meaning of every other word. So, while we thing students are improving their reading and vocabulary, they just end up hating reading entirely and never read for just pleasure. Extensive reading, on the other hand, is having students read a lot for pleasure, but the reading passages are well within their linguistic reach. For my students, if they can understand 95 percent of what they read, then continue with the book. Otherwise, choose something easier. In this way, I want students to be exposed to high-frequency vocabulary they could recycle in everyday language, particularly in a productive, speaking way. So, what are some ways to encourage students to read more and love it? Please share your ideas. English: Should it be the official language? There are movements around the United States to make English the official language where any government business can only be done in English (e.g., getting a driver's license). This could spread to the workplace or other situations. However, do such laws help foster unity within a society---a sign of patriotism, or do the become a divisive issue. What do you think? Polls: Do you have an idea? Common English Errors: Are native speakers good models? In a somewhat joking way, I recently asked how many of my students have native English speakers as roommates, and I replied by saying, "Oh, that's too bad." They were surprised by my response, but I commented on how often native speakers (regardless of language) are not perfect role models of how language should be used. This, of course, can lead learners to learn the language incorrectly and/or question what the right usage is. For example, which sentence is correct? She is tired, so she wants to lie down. She is tired, so she wants to lay down. Thus, how can ESL/EFL students best learn from native speakers so the use English correctly? Share your ideas. For this reason, I created my listening Website, EZslang.com (www.ezslang.com). So, do you have a favorite idiomatic expression? If so, share the expression, its meaning, and a sample sentence. Pronunciation or Grammar: Which is more important? 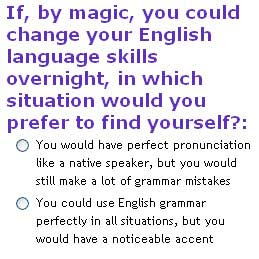 You would have perfect pronunciation like a native speaker, but you would still make a lot of grammar mistakes. You could use English grammar perfectly in all situations, but you would have a noticeable accent. Interesting enough, it appears that visitors are almost equally divided on this issue. But why? Which skill do you think affects a native-speaker's impression and reaction to ESL/EFL learners? Share your ideas on this topic. UFO: Are they signs of life out there? Appearances of UFOs, or unidentified flying objects, have been recorded for years, but are these real visitors from space or just made-up stories to attract attention. What is your opinion on the subject? Are there stories about such objects specific to your culture? Here is one Website that deals with the topic (http://www.nwlink.com/~ufocntr/). Share your ideas. Language Learning: Why does it slow at intermediate levels? Many ESL/EFL students experience a slowdown in their language learning once they reach an intermediate level of language proficiency, and they often do not know why. Although there are a number of factors that contribute to this, a main cause can be a fossilization (a state of not changing) of their language skills. 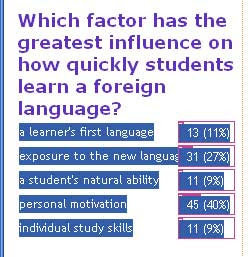 In other words, at the beginning stages of language learning, students are focusing on everyday topics like shopping, eating out, and directions; however, as levels increase, students need to be able to talk about more abstract topics or subjects (e.g., freedom, honesty, psychology) that require critical-thinking skills (e.g., compare, analyze information from various sources, infer meaning); unfortunately, students tend to try to rely on their basic language skills to talk about advanced topics instead of experimenting with newer language skills they are learning at the intermediate level. What complicates this matter is that most people, even in their native languages, tend to use basic language on a daily basis---you can't change that---and might not find themselves (or try to put themselves) in more challenging situations, particularly when learning a foreign language. Race Discrimination: Is it always real? Listen and share your thoughts on this topic. 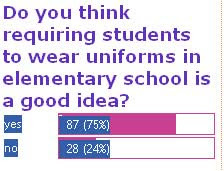 School Uniforms: Are they in everyone's best interest? Thanks for sharing your opinions on this poll. 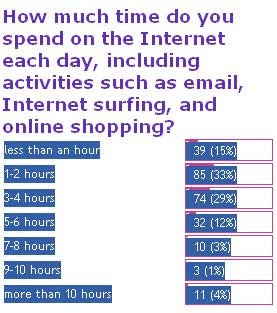 As you can see, 20% of those who responded spend 5 or more hours online. My question is how does being online affect normal, face-to-face relationships in a real world verses a virtual one. Please share any follow-up comments on the topic. Internet Addiction: How bad is the problem? We often speak of different additions to smoking, drinking, and even carbonated drinks like coke, but how big is the problem with Internet addiction? Using the Internet for education and work purposes is an indespensible tool today, but what about the effects that using the Internet can have on our daily lives and relationships? Share your experiences and discuss the problem in your own country? How can we live more balanced lives? Generation Gap: How have things changed? Generation gaps occur throughout the world as innovation, technology, and other advances take place. Such changes can affect society in a huge way. Personally, I was born in the early 1960s, and one of the biggest changes has been in how students study and do research. When I first was in college, students wrote their papers using a typewriter, and if you made a mistake, then you'd have to start all over again or try to correct it by erasing the errors. This was before the revolution of home computers and even the Macintosh personal computer in 1984. Now, many students have their own laptops or home computers. Furthermore, to do research, I always went to the library and used the card catalog to find the information I needed. Nowadays, students' first step is to browse the Internet. These changes bring their own challenges. I find that unless students know how to conduct good research and identify quality sources, they often can't judge what is accurate or not. So, please share your ideas on how time and generation gaps have affected your countries and areas. School Lunches: What and where do children eat? In schools across the world, children who go to school might have some sort of lunch during the day. However, where they eat and what they eat might be influenced by culture or local circumstances. For instance, in many schools in the United States, there is a lunch room where students can buy lunch. In the lower grades, there is a set meal which often includes some basic main item (chicken sandwich), plus some vegetables, and fruit. There are usually two choices. Of course, children can bring a lunch from home, which might include a sandwich, chips, an apple or similar fruit, and a cookie. What about in your country or area? Search Engines: Finding What You Need? 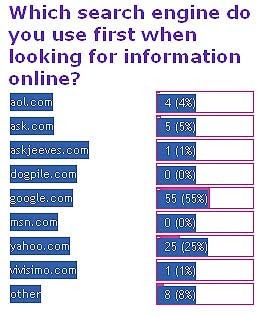 In this poll, I asked visitors which search engine they use first to find information on the Internet, and it wasn't surprising to see that Google came in first. This has been due, in part, to Google's simple design and efficiency. However, after showing many students and teachers other search engines with specialized features, they are surprised to discover that these engines often give better focused results that are not determined by link-popularity alone. In fact, websites like vivisimo.com group search results by clusters to help users brainstorm new ideas, and www.ask.com presents information of all types in your search results. Try searching something like "China" in both of these search engines and see what results you get. Share your ideas on the topic. Students and teachers can benefit from learning how to search the Internet more effectively. Emergencies: How should visitors prepare? Listen and share your ideas on this topic. Search Engines: Are they all the same? Listen and share your opinions on this topic. Preparing for the University: How long does it take? As an ESL teacher in the United States, I have worked with thousands of international students over the years, whose main goal is to enter North American universities to get a college degree. Unfortunately, a number of these students never reach their goal, in part because of unrealistic expectations on how easy it is to pass the TOEFL and deal with the rigors of academic life. 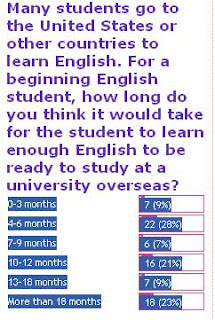 In this poll, 35% of respondents believe entering the university is possible within the first nine months of language training, but from my experience, the timing is longer due to many factors including the students' natural ability to learn, how much the student actually integrates into the community, personal motivation, and the types of courses a student takes. In other words, it is generally much more difficult than students think, and students often feel undue pressure from parents or sponsoring governments or schools to pass the TOEFL If learning how to order a burger from a restaurant is your goal, then this can be accomplished quickly. By raising your language to the level of participating in academic lectures is something very different. What do you think? Children or Adults: Who learns languages better? Listen and share your opinions on the topic. 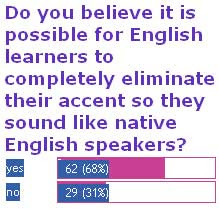 In one of my surveys on accent, I ask visitors whether they thought it were possible to completely eliminate one's accent when learning English, and I was somewhat surprised at the number of people who really think it is impossible. In fact, in my 20 years of teaching ESL, I have come to realize that accent elimination, contrary to what some might think, is nearly impossible for most people. On the other hand, reducing accent and improving comprehensibility is quite possible, and this should be the goal of most students. Unless students have realistic expectations on how much they can reduce their accents, they will always feel discouraged. So, what is your opinion on this topic? Physical Beauty: Is it all skin deep? An interesting video at http://www.campaignforrealbeauty.com called Evolution Film shows have our images of physical beauty are often distorted and cause us to create unrealistic images of what beauty is all about. Furthermore, the idea of physical beauty can vary from culture to culture. Please take a look at the short movie and share your ideas on what the image of beauty is from your cultural perspective. Ideal Teacher: Does age matter? In one of my polls, I ask visitors if the age and gender of their teacher mattered to them, and it appears that learners prefer younger teachers, with a slight preference for male teachers. 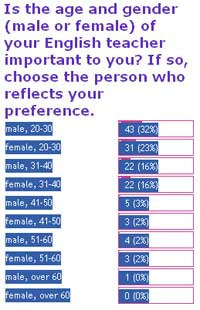 What could be the reasons behind these preferences? Does experience matter as well, or do learners prefer someone younger, perhaps closer to their own age? Are their other factors involved? Share your opinions on this topic. Listen and comment on this topic. Share your opinions. Mobile Phones: A New Language-learning Device? More and more people are carrying cell phones around the world, and now companies are trying to turn them into a new tool for learning English or other languages. However, whenever considering the potential of such tools, you have to ask yourself if the technology can be used in a sound, pedagogical way. In other words, just because people have cell phones and we can put audio on them, can people think of good, effective ways to learn a language through them? Are companies just trying to increase their profits, or are they truly concerned about end users: students and teachers. Do you have any opinion on this topic? Please share your ideas. Personally, at a soccer game, I might simply say something like, "Well, I really hope the team wins this match. They haven't been doing so well recently", or something like that. Now, share your ideas. Not too long ago, my kids encouraged me to give Gmail (www.gmail.com) a try to communicate with them, and I'm glad I did. One of daughters is at college, and I find the Gmail chat feature very helpful, especially since it keeps a record of the chat session. For language learning, I can see this as a very useful tool in that a teacher and student could share a live conversation which is recorded, and the student could review the chat session later. How about you? Do you have any favorite online tools, including email, to communicate and learn English? Network Sites: Are they safe for meeting people? While cell phones are becoming more and more popular, writing traditional messages, either by regular mail or email, is still an important way of communicating. In fact, there are Websites, like http://www.studentsoftheworld.info, that put you in contact with other language learners who want to meet other students with similar interests. This is also a great way of using your language skills to introduce yourself and share your hobbies and life. However, like all online services, students should use caution when sharing private information. Do you know of safe and friendly Websites that provide such services? Honesty: Do you always tell the truth? One of the cool features is that it has line-in recording, built-in mic, and a FM transmitter. The line-in feature allows you to plug in a mic or record directly to your advice from any other audio device, including other MP3 players or an audio CD player. For language study, having the ability to add a mic or simply use the built-in mic can allow students to record their voice as a means of keeping a voice journal. Share your ideas or suggestions on media players that can be used for learning. I asked the following question recently about the qualities that make an ideal teacher, and most visitors feel that patience is the most important trait in a teacher. Why do you think might be so? For you personally, what do you think? Can you share some personal experiences about a teacher from your past that made a difference in your life? Driving Etiquette: What is appropriate? In my travels around the world, I have noticed different behaviors in driving, some more orderly than others from my own experience. However, what would a visitor from another country finding interesting, different, or frustrating in trying to drive in your city? What behaviors are considered acceptable in certain situations? What are some unacceptable manners? What about honking, running lights, speeding, and parking illegally? Share your ideas and experiences. Accent: A Source of discrimination? A question I have often heard is whether employers can discriminate or not employ people based on their accent. We all have accents, but are they valid reasons why companies can legally or ethically choose not to hire people based on their pronunciation. Share you ideas on this topic because I am sure there are language learners that have some concern related to this issue. Listen and write your opinion on this topic. One of the greatest challenges as a teacher is to motivate students to use the language as much as possible in the classroom, and this is true both in the students' home country as well as overseas. In fact, although many students go overseas to study English, they often still use their native language with other students, and then really wonder why they aren't making progress in learning English. It doesn't take a math teacher to figure out why: If you attend English classes for four hours and then use your native language for the other twenty (or as many hours are you are awake), then it is impossible to learn English. Just being in the country is not enough, and unfortunately, the students' parents just assume their children are learning the language naturally. Therefore, how can teachers and students encourage each other to use English more instead of falling back on the native language? Should the teacher reward or penalize students when they don't speak English? How about having students pay money each time they slip into their native language? Please share your ideas. Poetry: How does this relate to you? Listen and explain how the poem relates to language learning and culture. 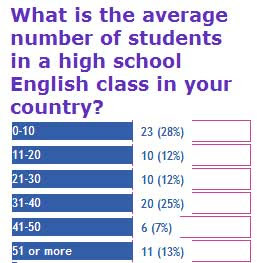 My recently polled visitors on the average class size of English classes in their high schools, and interestingly enough, 37% of classes average over 30 students. In fact, 11% of classes have more than 50 students. The question I have is to what extent this has an impact of learning and ideas on what teachers can do to improve learning despite the numbers. In other words, teachers have little choice as to the numbers of students in their classes, so what can they do in such situations? Share your ideas. Time Travel: Where would you go? One way to improve your listening comprehension skills is to combine watching music videos with the lyrics to the songs. One important element of music videos is that learners can watch the visual cues or clues in the videos to help them piece together some of the meaning. Then, if you read the lyrics of the song before watching, you have music, words, and pictures to help the learner. One site to watch videos is http://www.launch.com/. Do you have any suggetions or comments on music and English learning? ESL Classrooms: What impacts your learning of English? How important is it for teachers and students to only use English, or the language they are studying, in the classroom? Does it promote better learning, or are their times when the native language of the teacher and students be used instead? Share your ideas on the topic? Raising Children: What are the challenges? For many international students, their past experience in reading has been very intensive reading well beyond their abilities to comprehend and digest the material. In other words, teachers sometimes give students a newspaper article on some abstract topic, and then the students struggle with their dictionaries in hand looking up every other word to understand the passage. This is very discouraging and counterproductive. On the other hand, extensive reading is reading for pleasure at or below the level of students so they learn the joy of reading and are able to see vocabulary and grammar again and again for everyday use. With this in mind, what materials have you found most useful in learning or teaching reading skills. For me, I created a website, www.dailyesl.com, to help students see common expressions and vocabulary in common situations. Please share your ideas on the topic of reading. ESL students sometimes struggle with English because they don't understand idiomatic expressions that native speakers use. As students learn idioms, they will understand the language better and have a greater ability to express themselves with colorful expressions. One Website that focuses on idioms is http://idioms.thefreedictionary.com. Share your favorite idiom or Website that helps teach students this useful vocabulary. Paying for a University Degree: What do you think? Please listen and share your ideas on the topic. Personally speaking, when I lived in Japan for many years, I had to learn Japanese out of necessity in order to survive. However, I didn't mind trying to use the language even if I made mistakes. One time when my daughter was sick with constipation (you might want to check a dictionary if you don't know this word), I had to go to a drugstore to ask for medicine. The pharmasist didn't speak any English, so I had to rely on gestures to explain what I needed. How would YOU explain the problem using gestures? Anyway, after about 45 minutes, we finally communicated. The best part about the experience is that I gained confidence in getting my meaning across even in difficult sitatuations. So, what about you? Share a difficult or unusual experience you have had in learning English or any other language, and what they experience taught you. A Dinner Date: What would you say? Listen and write what you would do in this situation. An English Test: What would you do? Listen carefully and write your feelings on the topic. Listen carefully and write what you would do in this situation. I'm sure you have a number of unique ideas to share. Bargaining at Stores: Okay or Not? When traveling to a new country, you have to learn how to shop and buy the things you want and need. However, bargaining or trying to get the shop owner to lower the price is not a universal custom around the world. In some countries, you can try to convince the shop owner to give you a better deal on some jewelery or other items, and some of these exchanges can become heated. In the US, bargaining over the price of an item is rare, except at garage sales or some flea markets. In most cases, the price listed is the price you pay. So, what about in your country? What should visitors know about shopping? Can you haggle (bargain) over the price? If so, under what conditions and situations? Share your ideas. Dating: A Difficult Situation . . . Listen and comment on what you would do if you found yourself in this situation. 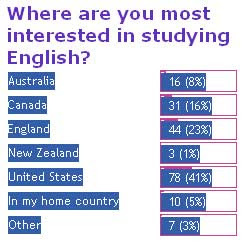 In my latest poll, I asked you, my visitors, to select where they are most interested in studying English abroad. As you can see from the results, most visitors chose the United States as their first preference, followed by England, and Canada. Why do you think the United States is a popular destination for students? Why are students attracted to other countries as well? What do students consider when studying overseas (e.g., cost, safety, visa requirements, etc.)? Share your ideas on this interesting topic. Tipping: How common is it? One of the most confusing customs is knowing when to tip for a particular service in the United States. For example, customers normally tip between 15-18% when dining at a restaurant, and how much you tip will depend on your feelings about the service. However, for large groups, the restaurant will automatically add the tip to your bill, so you don't really have a choice on how much you tip. Another place where tipping is not so uncommon is at beauty salon or barber shop. There is often a jar on the counter where you can drop in a tip for the stylist. What makes tipping sometimes confusing is that this is not a universal custom around the world. So, please share something about your culture when dealing with tipping? Is it a common practice at all? If so, when do people tip and how much do they leave? If people don't tip, do people do anything instead?